On September 1st each baseball season, teams are allowed to carry a MLB roster of up to 40 players. This is as opposed to the standard 25. Teams almost always promote at least a player or two though the outside amount seems to have something to do with their postseason aspirations. If you’re in the hunt for October you don’t want several inexperienced hands trying to find their way during a pennant race, for example. The Milwaukee Brewers aren’t exactly in that position this season. Sure they opened the day 7.5 games behind the brand new second Wild Card berth, and start things have happened as recently as last year, but to call it “unlikely” is quite fair. In part due to their record and in part because of the situational circumstances for certain player (i.e. shutting down Mark Rogers due to an innings limitation), the Brewers will probably be calling up a healthy group of their higher-end minor league talent. Infielder Eric Farris was a lock to be recalled in my opinion but was already called up to the 25-man roster yesterday after Cody Ransom was claimed off waivers by the Arizona Diamondbacks. I also expect the Brewers to help out all three areas in a couple of days when the Triple-A regular season has concluded. For the bench I would be shocked if infielder Taylor Green and outfielder Logan Schafer weren’t recalled. I do think they’re likely to call up outfielder Caleb Gindl as well. In the pitching side there is an opening in the starting rotation with the aforementioned exclusion of Rogers. Not coincidentally at all, right-hander Wily Peralta made his final start of the season for the Nashville Sounds on the same night Rogers was making his last for the Brewers in 2012. 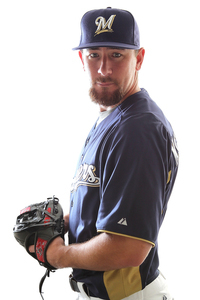 Along with Peralta, you can expect Tyler Thornburg to come back up and start once or twice add the season winds down. I would normally expect Mike McClendon to be rewarded for a long season with a recall but he was taken off the 40-man roster the most recent time he was sent back to Nashville. Any other bullpen help would likely come from outside the current 40-man composition but the Brewers can add as many as three players to it right now should they choose to do so. I do think they’ll add coverage though so perhaps someone will get an add. Maybe Brandon Kintzler, Donovan Hand, Rob Wooten, John Lowe, maybe even Hiram Burgos…just some names to think about. Regardless of who gets to don a Brewer uniform for the rest of the year, there should be plenty of reasons to continue to pay attention if only to see these guys get some playing time. So, those are my thoughts. Anybody I forgot about? Who do you think should come up? Why?